Public security officials cracked down on dozens of meat factories in China that use pork from pigs that died from disease. Police raided over 30 illegal meat factories, and arrested over 110 suspects, including government food regulators and insurance company staff, the Chinese regime’s Ministry of Public Security reported on Jan. 11. Police discovered over 1000 tons of the tainted pork, and 48 tons of waste oil products made from leftover tainted pork, reaching value of over 100 million yuan ($16 million), the report says. The tainted pork was extensively sold in markets in 11 provinces throughout the country for about three years, along with the assistance of insurance company staff and state food regulators, the report says. 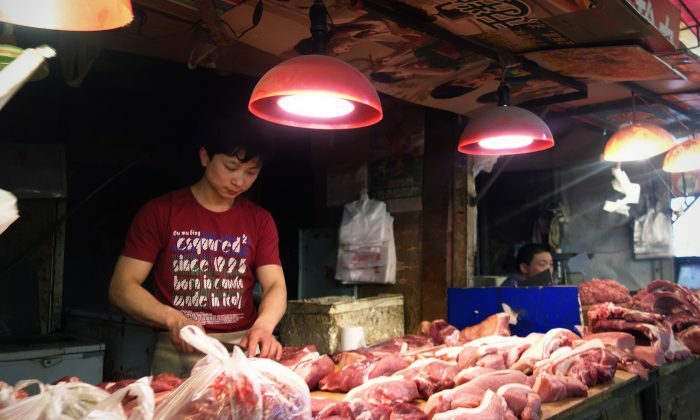 One of the meat producers who was arrested, Wei Qinghai, said that he would be notified of any dead pigs by insurance companies that insure livestock. Every time a farm would have pigs that died from disease, insurance companies would receive reports from the farm for coverage. The insurance company staff would then inform the illegal meat producers, and receive money in exchange. Every time a farm would have pigs that died from disease, insurance companies would receive reports from the farm for coverage. Wei indicated that he started purchasing tainted pork at very low prices in 2011, and had purchased nearly 2000 diseased dead pigs. Sometimes when the pork from the diseased pigs still looked fresh, it would be sold as fresh pork in the market. Some rotten meat that was not presentable was often made into bacon, sausage, or ground pork, according to another arrested meat supplier, Xiao Tijun. Leftover tainted meat and skin was made into cooking oil, the report says. A state-run media outlet’s news report shows video secretly shot at one of the illegal meat factories, showing two large filthy pots for making oil products. It was full of unrecognized objects and foam. Some of the meat suppliers are regulated private companies with licenses that receive regular inspections. The tainted pork was used for years because Animal Health Inspection staff were also bribed to collude with the meat suppliers. State regulators clearly priced the regulation ticket that supposedly guarantees the safety of meat. As long as they were paid, the regulators would issue as many tickets as the meat suppliers needed, the report says. During the secret trial, lawyers filed complaints against what they said was illegal behavior by the court.